Mashing up the dance with a badman blend of jungle, raggatek and breakcore, Stivs has been steadily hacking away at the rave scene for over a decade, lumping speakers across muddy fields, inhabiting warehouses for one night and one night only, and playing dirty ragga-jungle, breakcore and raggatek to jumping party people across the globe. A special birthday set from one of Erisian’s resident badmen. There might be cake! Music this silly really shouldn’t be this good. 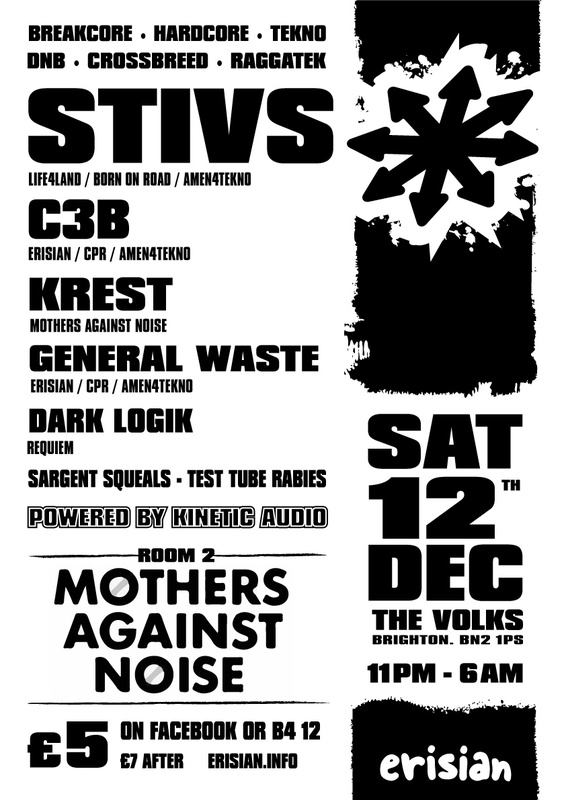 The Mothers Against Noise clan head upstairs to fill in some aural cavities. The Erisian resident and Community Payback Records founder smashes up Volks one more time for the festive season. Let me see ya mince pies in the air! If you’ve ever heard this man play out you’ll understand why we got him down here to smash out his heaviest stuff. We can’t wait to watch him tear the place apart.